In high school I was rated 1-A by the Selective Service. My folks couldn’t afford to pay for college and I wanted a break from school, so even before graduating in 1968 I talked with the USN recruiter. With Vietnam in full swing I figured the Navy was the safest bet. When my AFEES test scores weren’t high enough for the USN, he had me talk with the USMC recruiter across the street since I made clear I didn’t want to be drafted into the Army. Sgt Greene was a pretty straight-shouter. I could enlist for two years, which likely meant being a grunt in VN. I could sign-up for four years for a USMC tech school, but there was no guarantee I could quality for it. Or I could opt for three years which made everything 50/50. I enlisted for three years. 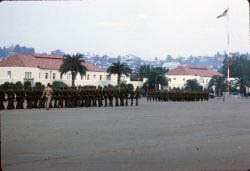 In boot camp I took the standard USMC tests, plus an optional journalism test to basically avoid extra time standing in formation in the hot San Diego July sun. The night before graduation I learned I’d been selected to be a USMC military journalist. After ITR at Camp Pendleton I attended the Defense Information School at Ft. Benjamin Harrison in Indianapolis IN. I was then assigned to MCB Quantico VA, where I wrote for the Quantico Sentry. After six months at Quantico I applied for orders to WestPac. My orders came through in late August 1969. I was to report to the 9th MAB on Okinawa. Going through processing on Okinawa my original orders were cancelled and I was assigned to 1st MAW Vietnam. 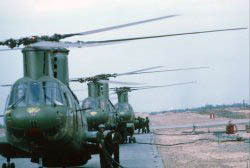 Reporting to 1st MAW ISO/PAO HQ in Danang, I was given the options of staying at HQ, going south to the Marine jet base at Chu Lai, or reporting to the large USMC helicopter base at Marble Mountain Air Facility four miles SE of Danang. I chose the choppers of MAG-16. I never considered making the Marine Corps a career. I did endeavor to be the best Marine I could be and do the best job I could while I served my country. Like the other USMC writers and photographers at MAG-16, I reported on and photographed, the men, their choppers and the missions they flew. I also wrote feature stories on various Marines at MMAF who worked on the ground to keep the aircraft flying. Most prized was to get temporary flight orders. Those orders allowed me to approach pilots and crew chiefs and request to fly with them on their mission(s) scheduled that day. I was never refused. I flew medevac, troop insert/extract, recon insert/extract and outpost resupply missions as well as a napalm drum bombing mission on an NVA HQ complex. Besides experiencing and reporting on the missions I flew, I took hundreds of photos of the people and events. Before my VN tour was completed I was pulled-out as part of one of Nixon’s “Phased Withdrawals” and sent by ship (USS Denver LPD-9) to Iwakuni, Japan, a USMC jet fighter base SW of Hiroshima on the Inland Sea. 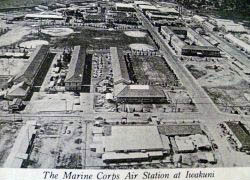 Iwakuni was the HQ of 1st MAW REAR and they weren’t expecting me and several dozen other Marines. After sitting on the dock for several hours, we were finally trucked to a Transit Barracks. At Iwakuni I was a reporter for the base newspaper, the Torii Teller. At Iwakuni I was able to journey to Hiroshima, where in September 1970 I visited the Peace Park and Museum. The central city was rebuilt. The A-Bomb park areas and museum were very somber. My final duty station was with the 12th Marine Corps District Public Affairs Office in downtown San Francisco. There I participated in various honor guards (including the Miss California pageant), sent supplies to recruiters and was flown to Billings MT to do a story for Leatherneck Magazine on a Marine Corps Reserve unit’s winter training in Yellowstone National Park. My 4312 MOS was judged ‘critical’ in 1970′ and I was offered a $7,000 reenlistment bonus and promotion to Staff Sergeant if I’d stay in. I declined the offer. I chose a different career and life path. As a combat correspondent with a Marine helicopter group my combat experience was limited to having helicopters I was flying in being shot at by the NVA and VC during medevac and Marine recon extract missions. 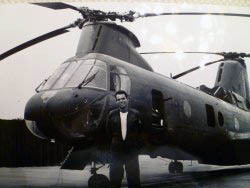 I was very lucky; neither myself nor anyone in any of the choppers I flew in was ever injured despite several aircraft taking numerous hits during missions. The most dangerous mission was an emergency extract of a recon team surrounded by the NVA in the Au Shau Valley NW of Danang. Despite USMC jets and chopper gunships providing suppressing fire around the zone, the chopper’s first attempt to land in the small jungle zone failed because of intense enemy fire. 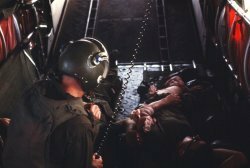 With the recon team’s survival at stake, the HMM-262 pilot of the CH-46 said he was going in again. With the jets swirling above us dropping bombs and strafing the zone’s perimeter, we came in straight and fast. While the port and starboard 50- cals. spit bullets, I stood in the large port side window and photographed the sequence of the recon team scrambling from the jungle and racing to the rear ramp. Our pilot gunned the turbines and the Frog screamed up and out of the zone to safety. Because of their bravery, the pilots and crew of the chopper on that mission all got medals. I didn’t get a medal, but that was all right because I got the pictures! I’ve always been appreciative of the pilots and crew chief for letting me fly that mission with them. 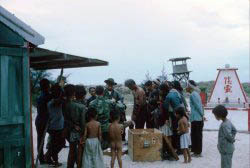 The photos and negs eventually found their way to HQMC’s Historical Division, where they where chosen by a publisher for use in a 1980’s Vietnam War coffee table book. I was very fortunate in that I had great duty and worked for and with wonderful people in several places. The highlight was being a writer/photographer at Marble Mountain Air Facility just outside Danang in South Vietnam. Following that I enjoyed my time at MCAS Iwakuni, Japan. My final posting was to 12th MCD in San Francisco, there’s no way SF couldn’t be great. Going undercover to investigate the training and operations of the Military Police/Shore Patrol unit at MCAS Iwakuni, Japan. A month before my arrival a Marine had died in a riot at the base brig. The unit was accused of institutional racism and brutality. Because I was unknown when I arrived on base from Vietnam, the Public Affairs Officer and Commanding General asked me to accept a short assignment to the MPs and then report on what I saw and experienced. I lived, ate and drank with men of the unit. I did road patrols, stood entry gate watch, walked a beat in Iwakuni city and stood Sergeant of the Guard on a Saturday night at the brig. My story was totally complimentary of the professionalism I saw the MPs/SPs operate under doing a hard, under-appreciated and thankless job. I saw no overt racism or brutality. Instead I saw and personally experienced the horrid effect alcohol has on people. As an MP I was kicked, spit on, pushed, punched and threatened with being killed. 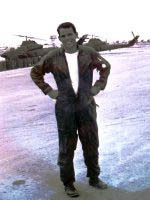 I’m most proud of the Air Medal and Combat Air Crew wings I earned recording, both in print and in photos, the exploits of the brave men flying helicopter missions in support of allied ground forces in Vietnam. There’s actually two and both are from boot camp. The first is Daniel Minor, my best buddy in the platoon whose maturity and understanding helped me deal with the brutal and confusing early stresses of the training cycle. Needless to say, I didn’t cheat on my diet again and nothing was ever said of the incident. The day before I got out of the Marines in mid-July 1971, Top Arnold, the Press Chief in the office had me sign a reimbursement form for mileage for use of my personal car on official business. No big deal. A few minutes later he and the other staffers in our Public Affairs Office ominously surrounded my desk. Top then handed me a fully completed USMC Reenlistment Contract for six years and at the bottom was my signature! They all clapped and congratulated me on my decision to become a Lifer. Then I noticed that my signature wasn’t a legally binding true original, it was a carbon facsimile. Top had slipped the contract’s last page beneath the mileage reimbursement form I’d signed earlier. As I’d enjoyed being a military journalist during my three years in the Marine Corps, I got a Journalism degree in college. When I graduated in 1975, however, there was another bad economic recession in the country and there were very few newspaper or other media jobs available. To pay the bills I got a temp job with the federal government in San Francisco that eventually led to being a loan closer with the Small Business Administration. I enjoyed that work which entailed a lot of people contact, detailed research and paperwork. Over the next few years I applied for several media jobs, but was never hired. I ended up spending 33 years in the residential mortgage business, where my journalism training and skills came in handy. For various companies I wrote and edited lending manuals and put together training programs. Now I am retired. I was fortunate to be able to retire in early 2008 when my last residential mortgage employer closed down. I am currently doing much travel. 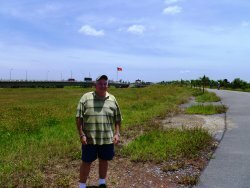 The attached photo was taken June 2011 during a return trip to Vietnam (the location is on the south side of the Peace Bridge over the Song Ben Hai in the former DMZ). * U.S. Marine Corps Combat Helicopter Association (has large reunions every 2 years of Korea, Vietnam, Persian Gulf, Iraq, Afghanistan chopper veterans and active duty Marines. * MCRD San Diego Museum Historical Society. * Vietnam Veterans of America. * Vietnam Veterans Memorial Fund-dues help to maintain The Wall and build a visitors’ center. * Marine Corps Heritage Foundation-dues help maintain the National Museum of the Marine Corps. Military service taught me self-reliance, discipline, organization and the courage to face obstacles unafraid, as well as to not be intimidated by anyone or anything. It further taught me to more truly appreciate the courage and sacrifice of everyone who has ever served our country and to value the kinship and friendships of others who have served. The values and mental toughness I learned in the service have served me well in my personal life, professional career and when I officiated high school and small college sports. Do the best you can do at whatever task you are assigned. Regardless of how the big picture military events turn out when they recede into history, i.e. Korea, Vietnam and the wars in Iraq and Afghanistan, be able to look back with pride in the knowledge that you and your comrades did what your country asked you to do. Let others debate whether policies and results are right or wrong. Always know that you did your country’s bidding and served it honorably. Also that time goes by so fast! Memories quickly fade except for truly exceptional events. So although it may seem dumb and senseless at the time, make notes and take pictures/videos of the people and places you are stationed at and the events whether training or in combat you experience. They become a record as you proceed through life. Together We Served is a great place to not only find those you have served with, but also to honor those who have paid the ultimate price.